The data was added on ,	10 May 2018 read 250 times. “Last night you heard that the US president made silly and superficial remarks. There were maybe more than 10 lies in his comments. He threatened both the establishment and the nation, saying he will do this and that,” Ayatollah Khamenei said in a meeting with a number of teachers and university professors in Tehran on Wednesday. The Leader made the remarks one day after Trump announced Washington’s withdrawal from the Iran nuclear agreement, officially called the Joint Comprehensive Plan of Action (JCPOA). 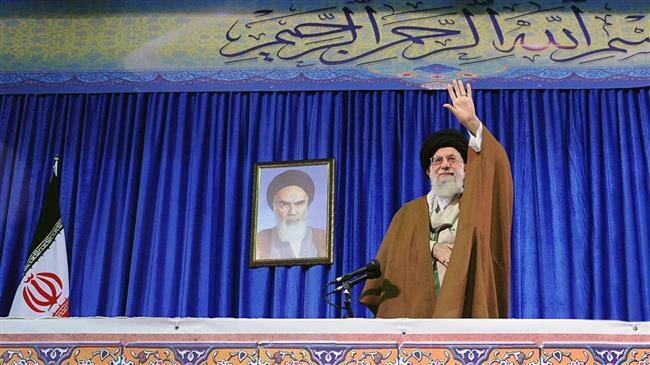 Ayatollah Khamenei stressed that the US problem with Iran was not related to the country’s nuclear program. “We accepted the JCPOA, but enmities with the Islamic Republic did not end. Now they raise the issue of our presence in the region and the issue of missiles. If we accept them too, they will bring up another issue,” he said. “The reason for US opposition to the establishment is that the US used to completely dominate [Iran] but the [Islamic] Revolution cut off their hands [from the country],” he added. The Leader said the Americans want rulers who would carry out their errands and dish out their money, as is the case with the Persian Gulf states. A few days ago, Ayatollah Khamenei said, Trump sent a letter to the Persian Gulf countries, saying he had spent $7 trillion in the region for them and that they had to compensate. “You spent money to dominate Iraq and Syria; well you couldn’t, damn it to hell!” the Leader noted. “The ugly and silly behavior of the US president was not unexpected. This behavior existed in the era of former presidents in different forms. The Iranian nation has stood firmly and those ex-presidents have died and their bones are rotten but the Islamic Republic is still there,” Ayatollah Khamenei said. The Iranian press and people of all political leanings lash out alike at the United States over its withdrawal from the multilateral nuclear deal with the Islamic Republic. Speaking about the nuclear deal’s future, the Leader said he did not expect Washington’s European allies — the UK, France and Germany — to honor the deal either. “We do not trust the three European countries, like we don’t trust the US; without receiving a strong guarantee from these three European countries, we won’t stick to the nuclear agreement,” said the Leader, referring to the UK, France and Germany. Iranian President Hassan Rouhani said shortly after Trump’s announcement that Iran will work with Russia, China and the three European nations to keep the deal in place. “It is said that we are going to follow through with the three other European countries. I do not trust these countries either. Do not trust them. If you want to agree on anything, make sure there are practical guarantees in place. Otherwise they will do what the US did to us,” said the Leader. Ayatollah Khamanei stressed that without solid guarantees in place, there was no reason for Iran to stay in the agreement.